At Emery Medical Solutions we specialize in ultrasound imaging services in Apopka and all of Central Florida. Ultrasound imaging or Sonography has been used by radiologists and sonographers to image the human body for at least 50 years and has become one of the most widely used diagnostic tools in modern medicine. Ultrasound uses sound waves to provide information about internal organs and soft tissue, such as the heart, liver, gallbladder, spleen, pancreas, kidneys and bladder. 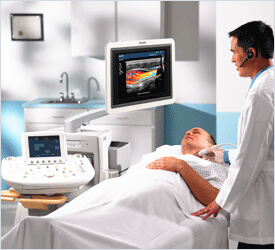 Ultrasound data, gathered in real-time and displayed on a computer monitor, often is used for examining a fetus in utero, studying the flow of blood through veins and arteries, and in diagnosing gallstones and prostate abnormalities. Since ultrasound uses sound waves and their echoes, rather than x-rays, to view internal anatomy, the patient is not exposed to radiation. Ultrasound also can provide information about tumors and cysts that cannot be gathered by conventional x-ray. In most ultrasound examinations, a hand-held transducer is placed on the patient’s skin. The transducer is both a transmitter and receiver, sending reflected echoes that are displayed as a two-dimensional image on a video screen.